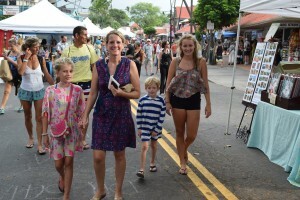 One Sunday each month from 1pm to 6pm Alii Drive in Kona’s Historic Kailua Village becomes a festive, pedestrian-only outdoor marketplace that makes for a fun family-friendly day. Leashed dogs are welcome to stroll too! Celebrating its 10th year, over 100 Kokua Kailua vendors gather once a month on Alii Drive, from Kailua Pier to Hualalai Road, to showcase shop local opportunities, entertainment and delicious munchies. Local artisans and crafters, musicians and friendly merchants welcome the crowd. There is no better place to spend a Sunday afternoon than strolling through the seaside village. Shop, dine and buy local at Kokua Kailua.